Please have a read before embarking on your marathon journey. The most important thing to remember is YOU chose and paid well earned money to run this race. The prime reason underpinning that choice is enjoyment (unless you are a professional athlete). Joy and gratitude should be the driver for the training journey, and the race plan - if there is no joy we need to do some unpacking of your "why". The essence of marathon running is conserving energy, and apportioning it evenly over the 42.2km. Resistance in the body or mind will chew up energy and therefore remove it from the momentum forward. I love Alex Hutchinson's quote in his book ENDURE - "the brain and body are fundamentally intertwined and to understand what defines your limits you can't separate them". Most athletes think energy is all about the nutrition, but I can tell you I feel the most "energetic" at the end of my weekly 20 hour fast. The nutrition you take on board is one part of the energy equation. Energy is also related to you being engaged fully in the moment, being curious, and tapping into the pure joy of the experience. This awareness will help with your flow and conserving energy for the entire race. One of the best pieces of advice I was given in regards to pacing (and even energy apportioning) is "the first time you feel like increasing pace DON'T, the second time you feel like increasing pace DON'T, and the third time you feel like increasing pace you WON'T be able to." Going out at an planned even pace or intensity (this is a better way to gauge as environmental conditions e.g hills, headwinds, will effect pace) and then holding that while working on your efficient energy saving form from km to km is a far better way to manage the distance rather than continually checking your pace often, or making sure you are in a specific heart rate range. 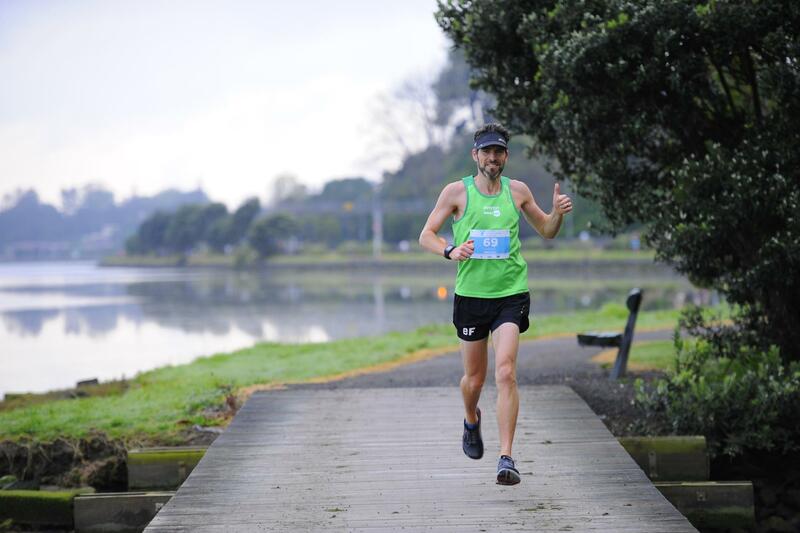 Upright, head facing in the direction you are heading (don't look at your feet especially in the final 8km, if climbing a hill look to the top), gentle forward lean from the ankle NOT the pelvis, shoulders and face relaxed, with a relaxed arm swing in time with the leg turnover. These cues will ensure body efficiency. Channel Bruce Lee with "relaxed tension" - so enough tension to hold the body in place, and make use of the elastic potential after foot strike, but relaxed so NO energy is wasted with inefficient tension. Focus on joy and gratitude for your ability to have this moment. When the discomfort builds focus on your form cues, and if any negative thoughts enter your mind, recognise them, tag it as "not helpful" and let it go. The body will always follow your mind. Do not let the mind hijack the moment with unhelpful dialogue. Smile at other runners, and give some encouragement. You are not alone in the race and it sharing the experience you will improve yours and others performance. Samuele Marcora (exercise scientist at the University of Kent's Endurance research group) has completed some fascinating research on how mental fatigue, and pictures of frowning faces (compared to joyous ones) can negatively effect your ability to exert effort. Always go into the race with a plan. I tell ALL my athletes, make sure you have read all the race information. Know the start time, when you plan to have breakfast (2.5-3hrs before race start), know what that is, when you plan to arrive (I like to be at the start line 45-60min before the start to warm up, have a last toilet stop, and be unflustered and relaxed at start time). know where the drink stations are, what they are serving, when you are taking your nutrition (remember to have water with your food, and electrolyte on it's own). Know the course - where are the hills, what is the wind direction (where could you use others to shelter and conserve energy). Remember to change the plan if conditions change. Never follow a plan blindly, always listen to your intuition to help guide. If you experience cramping, don't fight it. Accept it as part of the bodies and minds way to slow you down due to raising discomfort. Alter your stride, slow down a little, breath deep. DON'T stop and vigorously stretch; slow down to a walk if you have to, do some side to side steps, take a drink, and then ease back into your running gait when able. DON'T freak out about your time, this resistance will prolong the cramp. It will go away. Celebrate this moment. Don't be one of those runners that utters excuses at the finish line - YOU did the best you could with the training you did, and the race you had. Own it, then you will learn from it. If people ask you how you went, talk about the process, and the experience. EVERY one is too preoccupied with the time. The time will take care of itself when the process is nailed down. Within 48 hours of finishing make your notes on the platform about what went to plan, and what didn't. Note down your thoughts on how to improve the process.